The latest in the WWII series by Simon Forty and Leo Marriott provides a unique, highly illustrated perspective on The Battle of the Bulge using maps, photography old and new, hardware, memorials, museums, and cemeteries to give an overview of this crucial campaign. Just after its seventieth anniversary, the Battle of the Bulge has lost none of its impact. The largest battle fought by US troops on the continent of Europe started in a surprise attack on December 16, 1944, by four German armies, spearheaded by the cream of the German Panzer forces. Under the cover of bad weather and heavy snow, Hitler's last roll of the dice was intended to retake Antwerp, split the Allies, divide their political leadership, and force peace in the West, thus allowing the German forces to concentrate on defeating the Red Army. Strategic pipedream or not, the attack was furious and drained the Eastern Front of reinforcements: 12 armored and 29 infantry divisions, some 2,000 tanks and assault guns—mainly PzKpfw IVs (800), Panthers (750) and Tigers (250 including some of the new King Tigers)— spearheaded the assault, which smashed into the American First and Ninth Armies. Within ten days the German attack had been nullified. Patton, at the time planning an attack further south, wheeled his Third Army round in a brilliant maneuver that relieved Bastogne and set up a counterattack which would drive the Germans back behind the Rhine. The Ardennes Battlefields includes details of what can be seen on the ground today—hardware, memorials, museums, and cemeteries—using a mixture of media to provide an overview of the campaign: maps old and new highlight what has survived and what hasn't; then and now photography allows fascinating comparisons with the images taken at the time; aerial photos give another angle to the story. The fifth book by Leo Marriott and Simon Forty provides a different perspective to this crucial battlefield. It will be good for the historian who has an interest in the Battle of the Bulge and there are some excellent reference photos and inspiration for modellers. It is equally ideal for the battlefield visitor, with details of what happened where and with what to look for in terms of memorials and memorabilia that would be worth looking out for if you plan to visit the area. This is a high-quality combination of maps, photographs, and key text commentary…Another fine title in this excellent series of Casemate publications." - Winner of the 'Miniature Wargames Recommends' award for March 2018. 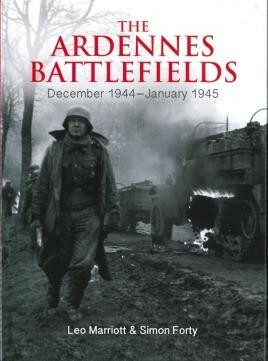 Once again this is another book that makes you want to load up the car, hit the ferry and go touring in the Ardennes. Listed in Military History Monthly's round up of the best military history titles for March 2018. I love this book as much as its predecessors. The style works for me and I have found it to be useful and quite inspirational.